Duqm Special Economic Zone Authority (SEZAD) shall organize the Duqm Calls promotional campaign in Singapore on the 9th of September 2013 and site visit with the participation of a number of entities and operating and investing companies at the SEZ at Duqm. The Sultanate\\'s delegation shall be headed by H.E. Yahya bin Said bin Abdullah Al-Jabri, Chairman of SEZAD. Its membership includes a number of officials from SEZAD, the Ministry of Agriculture and Fisheries, the Public Authority for Investment Promotion and Export, Oman Drydock Company, Duqm Port Company, Omran, Oman Oil Company, and Takamul. The promotional campaign aims to highlight the projects, investment opportunities, incentives, and tax exemptions, provided to investors at the SEZ at Duqm. The opportunities available in various fields, such as logistics, tourism projects, fishery industries complex, and oil and petrochemical industries complex shall be presented; benefits and incentives granted to investors shall be reviewed; and investment climate in the Sultanate in general shall be explained. 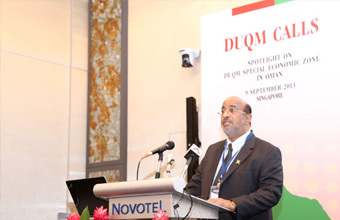 The promotional campaign shall familiarize businesspeople in Singapore with the investment opportunities in several projects at SEZ at Duqm within the efforts of SEZAD to attract foreign investments towards the achievement of its objectives in turning the SEZ at Duqm into an oasis of domestic and foreign investments. The promotional campaign includes bilateral meetings between SEZAD officials and participating entities and companies on one part and businesspeople in Singapore on the other to answer all queries relating to investment opportunities, tax and non-tax incentives, investment climate in the Sultanate, foreign ownership percentages and other inquiries. The program of the promotional campaign also includes site visit to the Port of Singapore, and industrial and economic zones to get a first-hand experience of the progress made by Singapore in these areas and the potential to benefit from its experience towards increasing the economic returns of the projects implemented at the SEZ at Duqm. Singapore, located in South-East Asia at the southern tip of the Malay Peninsula, is the fourth most important financial center in the world and its capital is a global city that plays an important role in the global economy while the Port of Singapore is among the most active international ports. Statistics indicate that Omani exports to Singapore last year increased to reach OMR (710.4) million compared to OMR (167.5) million in 2011, while imports increased from about OMR (39.3) million to OMR (51.6) million. Crude oil is one the most important Omani exports to Singapore as (19.6) million barrels were exported to Singapore last year, i.e. (7%) of the total crude oil exports of the Sultanate. In 2012, Singapore ranked fourth among oil-importing countries from Oman after China, Japan and Taiwan. The Sultanate signed a number of agreements with Singapore, notably: the Agreement on Avoidance of Double Taxation and Prevention of Tax Evasion ratified by the Royal Decree (96/2003) dated 21st of December 2003 and the Agreement on Mutual Encouragement and Protection of Investments signed on 10th of December 2007 and ratified by the Royal Decree (101/2008) dated 1st of September 2008.